What is Jasmine Oil ? Jasmine absolute oil is an exquisitely scented oil, intensely rich and exotic with its honey, floral fragrance. Although it is one of the sensual oils, it also has other therapeutic properties. It is dark amber brown in color and is extracted by special method from the delicate flowers. It has been favored in perfumery. Jasmine is useful in treating headaches, depression, and is a known aphrodisiac. Also, it is anti-inflammatory and analgesic, so is useful with skin problems. It is beneficial to some in memory stimulation. Jasmine absolute oil blends well with coriander, neroli, bergamot, ginger, palmarosa, rose, orange, petitgrain, ylang-ylang, patchouli, clary sage, and sandalwood. 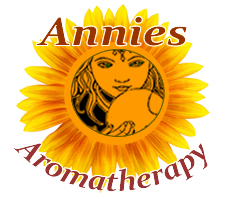 Use in an aroma lamp for an alluring ambiance or add to a massage oil. It is not surprising that, although it is used sparingly due to its powerful scent, it is a key ingredient in this harmonizing sensual romantic massage blend. 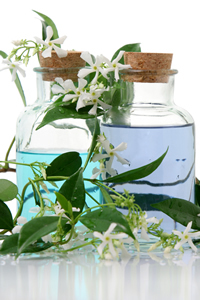 Jasmine flowers are a gentle remedy for skin care and are used in washes and ointments. Jasmine teas are a gentle sedative. Botanical Information - Rituals & History : The jasmine is a shrub, producing dainty while flowers that are picked at peak before dawn to maximize their oils when extracting. This night blooming fairy vine encourages the magic of the evening - mystery, love, psychic dreams, and enchantment. For centuries in Egypt, India and the Orient, only the privileged upper classes were permitted access to this precious oil.